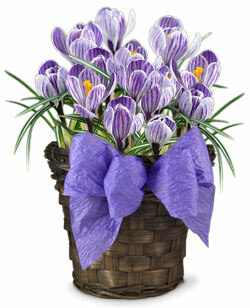 Description: Sweet purple blooms make the sweetest of holiday gifts, appropriate for any holiday or personal occasion. This impressive gift includes 7 premium crocus bulbs placed in a rich, brown willow basket, and decorated with a pretty paper ribbon. We top each gift plant with decorative moss, and pack for safe shipment to ensure it arrives ready to display. Simply water, and the flowers open in just 4 to 6 weeks. Basket measures 5.5”diameter x 4.5” height.